Drawing & Painting Fantasy Landscapes and Cityscapes―Award-winning science fiction and fantasy artist Rob Alexander instructs readers on creating landscapes that evoke myths and legends, lost empires, futuristic planets, dramatic dreamscapes, underwater worlds, and subterranean cities. Drawing & Painting Fantasy Beasts―Kevin Walker covers basic anatomical forms of animals in nature, then teaches the reader how to distort these shapes to create fantastic beasts from literature and legend, double-headed sea monsters and serpents, satyrs, centaurs, dragons, and demons. Drawing & Painting Fantasy Figures―Noted fantasy artist Finlay Cowen coaches students in the creation of heroes and heroines, villains and wizards, dragons, and manlike beasts with techniques for drawing characters with special attention to their faces, bodies, action, and costume styles. 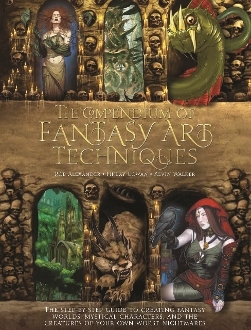 Along with a review of essential tools and techniques, tips for developing ideas, and gallery after gallery of more than 650 stunning images, this comprehensive book is an incredible value for fantasy artists of all levels.